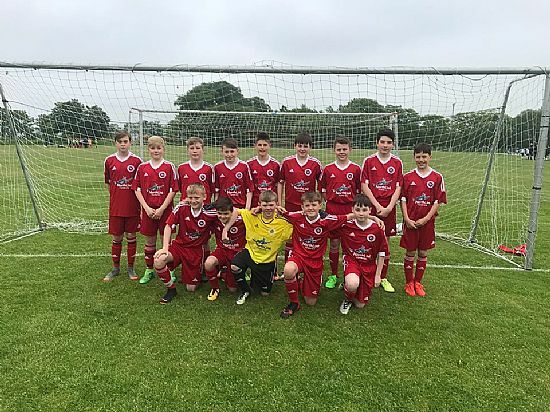 An Orkney Under 13 Football Squad travelled to Dingwall for the 2018 Highland Football Festival on Friday 25 May. The 2 day trip involved 5 x 40 minute games and with good weather all weekend the players involved had little energy left by Saturday night having given their all on the pitch. On Friday night there was a game against Caithness. The team started fantastically, totally dominant for the first 10 minutes, but the Caithness goal was leading a charmed life which allowed Caithness a foothold in the game and they ran out narrow winners in a game which the Caithness coaches could not comprehend how they had won. On Saturday morning the day started with an excellent win against the Western Isles which was followed by a narrow defeat against a strong Shetland team. At 1-1, with less than 10 minutes to go, an Orkney shot contrived to hit both posts and stay out which was cruel on the players who each gave their all. By now the players were tiring and were defeated by a very well drilled Elgin City team before finding reserves of energy in their final match against Alness United only to be pipped by the odd goal in 3. A thoroughly enjoyable trip made possible by use of the Sea Cadets Mini-Bus and with thanks as ever to the generous assistance provided by Northlink Ferries. Also a big thanks to Peter Budge at Ross County FC for making the weekend possible.